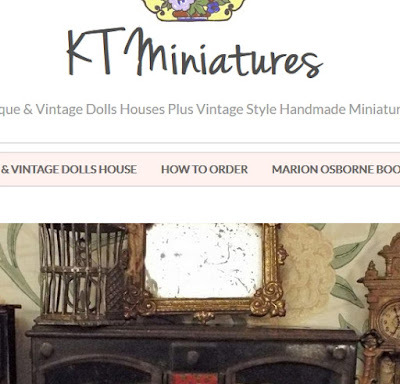 Just to let you know that I am currently working on a brand new rather lovely KT Miniatures website! It is most definitely time for a change, as I understand customers are encountering a few niggles when viewing my current website on tablets and mobiles! Anyone who is familiar with website creating, will understand when I say that I am currently moving over from the Dreamweaver design system to Wordpress. 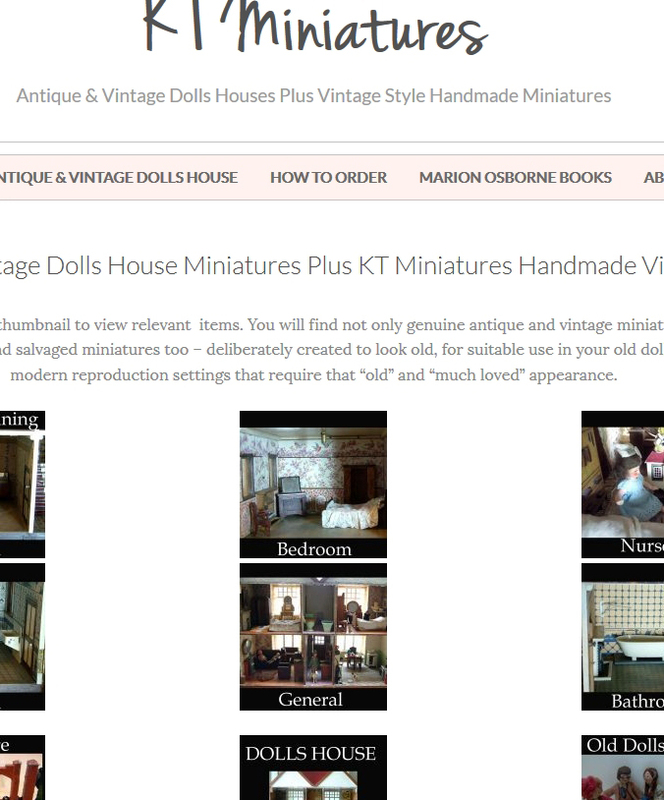 Before I attempted to even start on creating using a new website template, I have had to get to grips with Wordpress, although I am coming to the conclusion that it is an easier system to use than Dreamweaver on the whole. Time will tell. As long as there are no major disasters, you can see a tiny glimpse of what my new Home page will look like in the above image. But I have quite a way to go still. Mr KT has always been my much relied on "IT Director" from the very beginning, but unfortunately he is now very much "under the weather" these days, so I can no longer expect him to automatically and immediately sort out the endless niggles with the old technology on my current website system. Consequently, after much discussion and pondering, we concluded that new strategies now have to be put into place. This new website will be one of them. Meanwhile, I will continue selling on my current website until the new website (fingers, toes and everything crossed) is fully up and running. Well, I Just Couldn't Throw These Away, Could I? 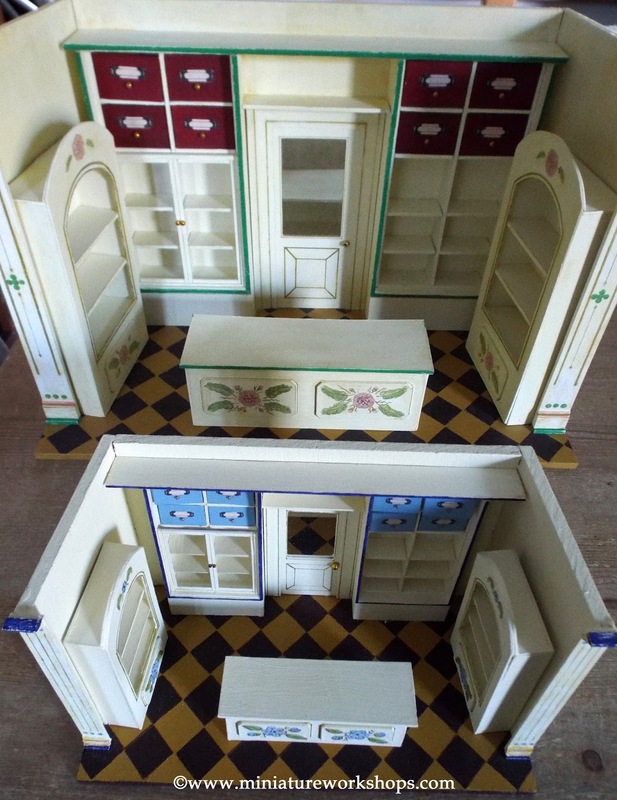 Am sure every antique and vintage dolls house collector is faced with the dilemma from time to time, of what to do with heavily damaged and broken antique dolls house furniture? I have a very large box with all kinds of "spares" saved from broken miniatures but in reality, I cannot keep absolutely everything. 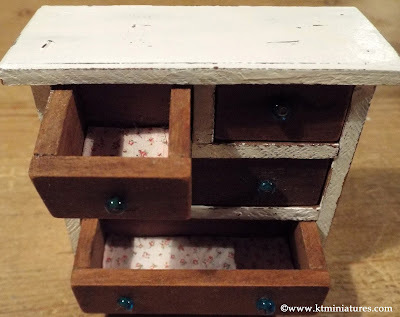 Well, I had two extremely old dolls house chest of drawers, both badly damaged but still had such a charm to them...I just couldn't throw them away and I did'nt want them to end up in the ever growing "spares" box. They sat on my workbench for quite a while, staring back at me rather expectantly, as I pondered on what I could do with them. Then one day, I finally set to in bringing them back to life! 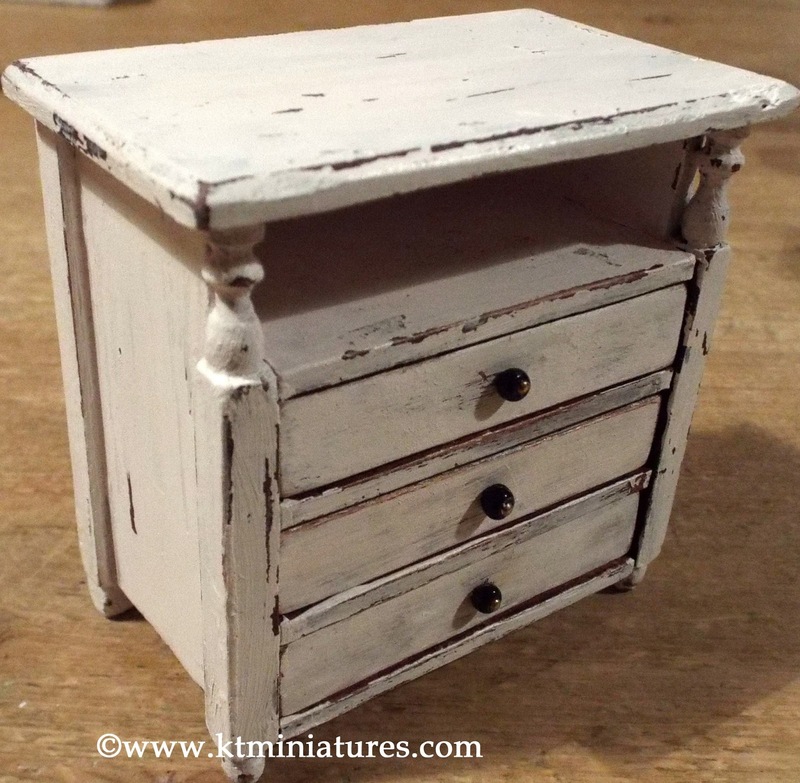 This was my favourite, a genuinely early 1900s miniature chest of drawers. Not only was it missing a drawer, it was also missing handles and there was some damage to the exterior. 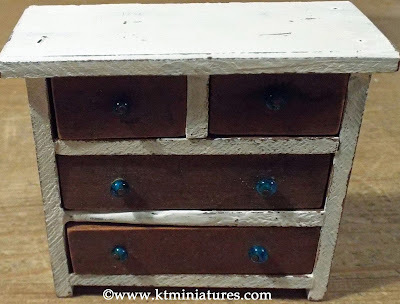 So, a new drawer was made, damage was made good with filler and lots of sanding ensued! 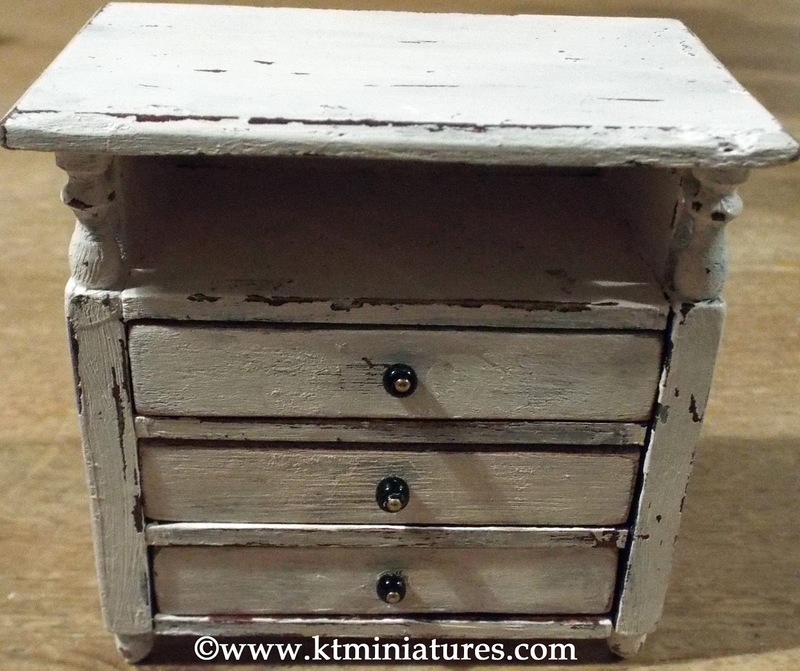 Once I was happy with the repair work, I gave it the KT Miniatures aged white paint treatment. I challenge anyone to figure out which drawer was the replacement! Three little handles were made out of tiny black beads and weeny pins. Then a coat of wax polish and lots of elbow grease in buffing to a nice shine. Finally, for a nice pleasing touch, I created replica antique paper scaled right down to line the inside of each drawer, just like I have in my real life sized antique chest of drawers! I was chuffed to bits with the result! Then my next dilemma was what to do with it. I tried shoe horning it into each of my old dolls houses here, but there was simply no more room for yet another old chest of drawers in any of them. 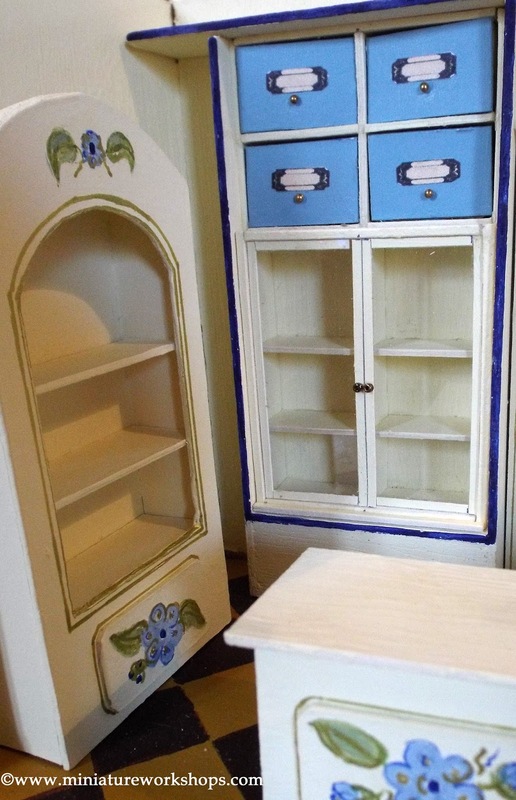 So reluctantly, I put this up for sale today, along with the other salvaged antique chest of drawers, which is even older. 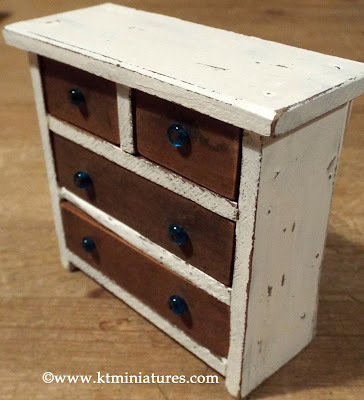 Ok, this second chest of drawers is far from perfect, but if only you saw it before the makeover!! The only things it had going for it was its age...(late 1800s/Early 1900s, a remnant from the Oxford Collection), all the drawers were present and in good condition, plus it had all the original blue beaded handles! But the damage to the main carcass was quite considerable, a huge chunk of wood was missing from the shelf divider in between the two long drawers. 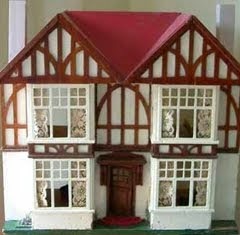 Plus the exterior was in a hideous condition, badly marked, stained and pitted. 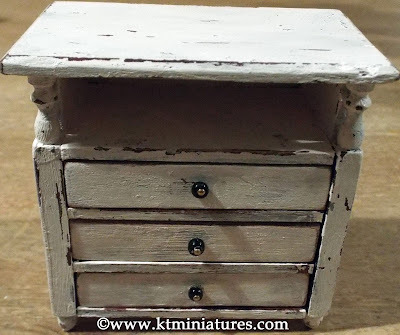 I tried to build up the missing chunk of wood as much as I could, within the restraints that I had, filled and repaired the damaged exterior wood, then gave the main carcass the KT Miniatures aged white paint treatment. 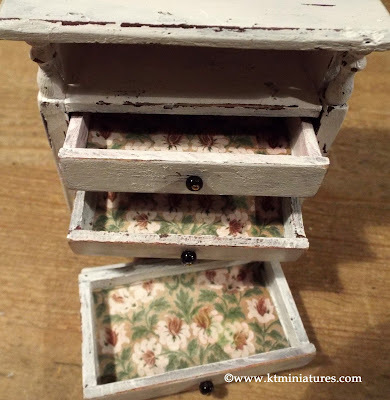 As with the other chest of drawers, I created replica antique paper (this was different from the other paper and very pink!) scaled right down and lined inside all the drawers. Suddenly this wreck of a somewhat chunky chest of drawers, looked alive once more, even if there is still a slight indentation on the shelf divider! 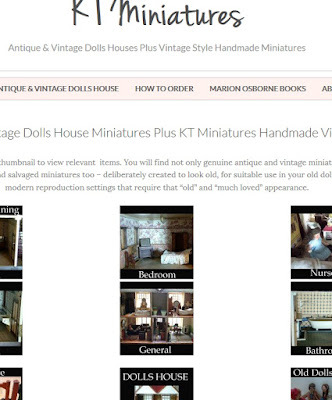 Antique & Vintage Bedroom Page . 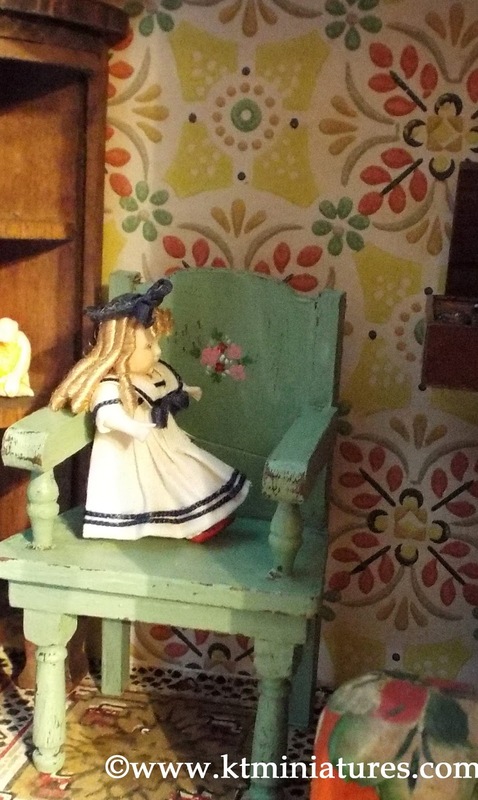 A broken c1920s/1930s German chair was glued back together, the massive crack along the chair back was filled, then the whole chair given a pale green aged finish. Finally I painted some flowers using a tiny brush. This now sits in my antique toy shop and I love it! 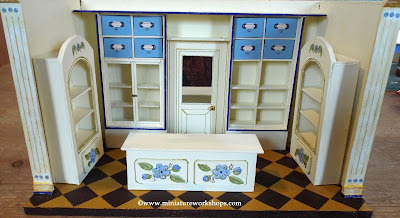 This old toy shop is my latest project in my own personal collection by the way....and I hope to bring you a blog posting all about this one day very soon. Booking Closing Next Week For Summer Workshops! This is just a brief note to let you know that booking will be closing for our summer workshops at the end of next week - Friday 15th April. So if you have been pondering and procrastinating on whether to sign up for either our all day workshop on Saturday 4th June or Saturday 2nd July, then ponder and procrastinate no more....please get in touch asap and book now! 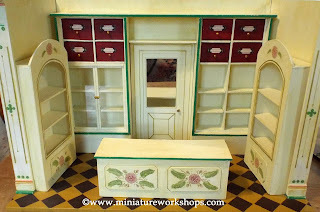 This is what we will be making....an early 1900s German style shop, offered in both 1/12th and 1/24th scales. 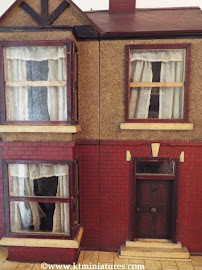 And this is the 1/12th scale version. 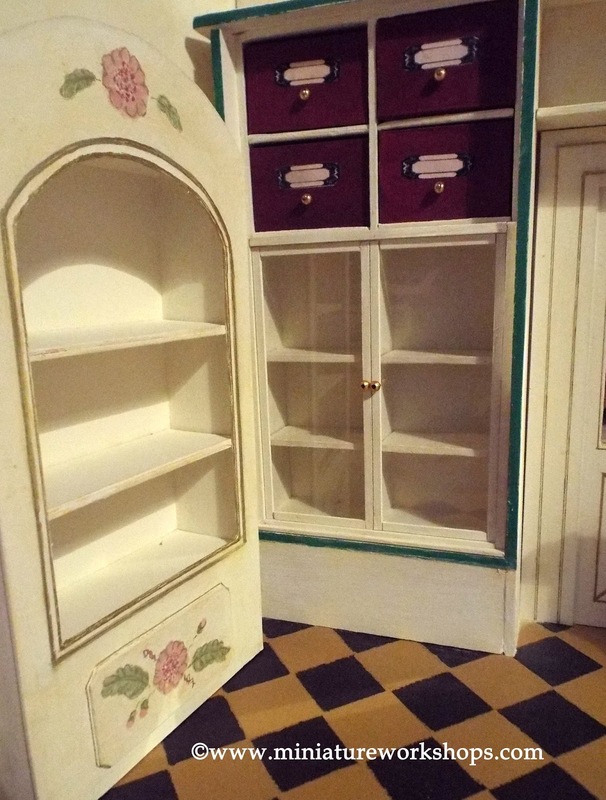 We will give you materials and instructions to create what you see here as part of your kit, but you also have the option to decorate, furnish and configure your shelves as you wish. 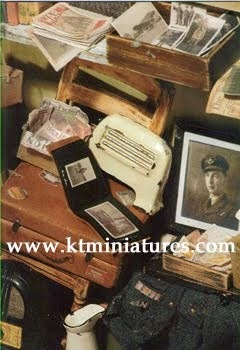 I will also have available to purchase on the day, small pieces of KT Miniatures antique wallpaper at a bargain price! 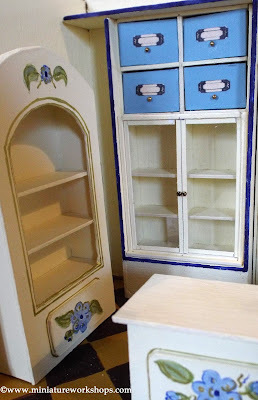 Alternatively, you may have your own special papers or paint, that you are welcome to bring and use. 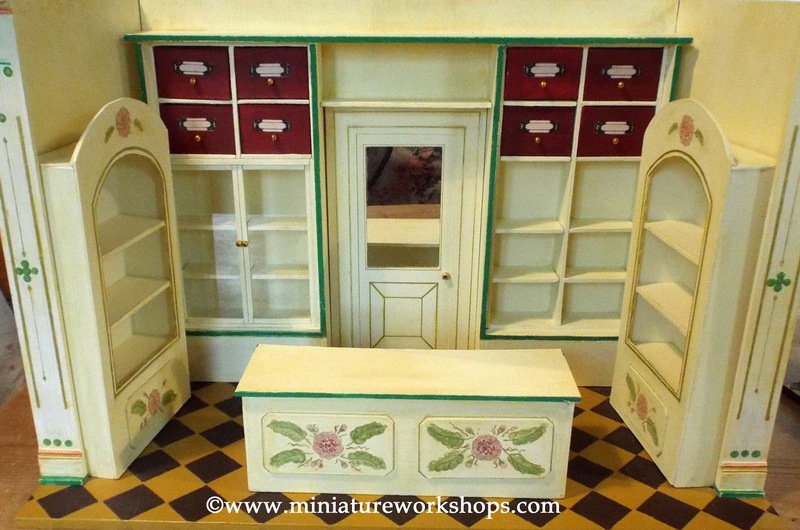 Also included as part of your kit, but not seen here are materials to make a set of old fashioned scales, an antique style hanging lamp plus some other shop accessories. 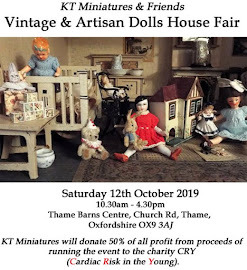 Antique miniature shops these days can cost an absolute fortune...so this is a good opportunity to join Robin and me for a day with like minded people at Bicester Avenue Garden Centre and make your own! 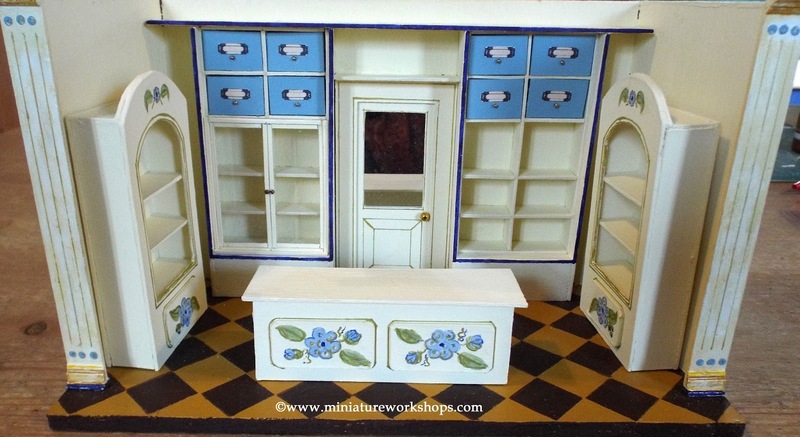 Full details can be found our our workshop promotional page, including a downloadable booking form.